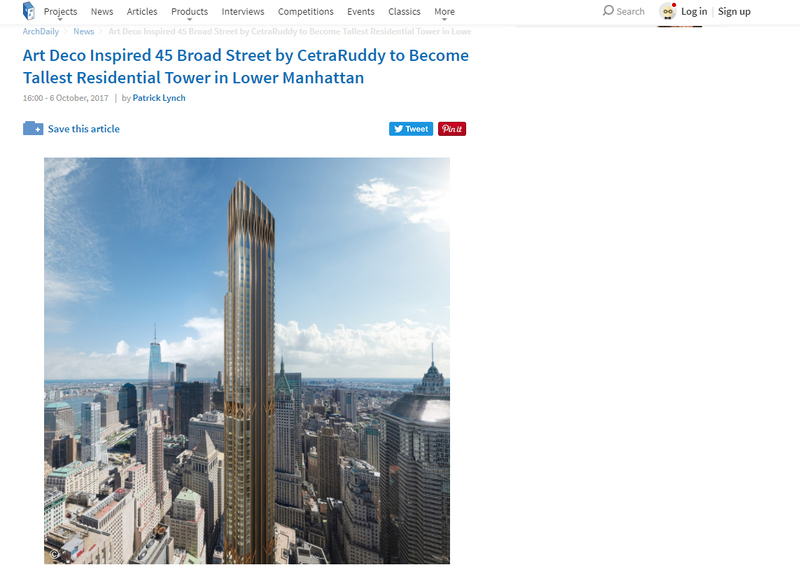 Harkening back to the Art Deco structures of New York’s Financial District, CetraRuddy’s 45 Broad Street is set to rise in Lower Manhattan. After a groundbreaking ceremony in April, construction on the project has now begun. Once complete, the tower will top out at a peak of 1,115 feet (340 meters), making it the second tallest building in lower Manhattan (behind only One World Trade Center) and the tallest residential building south of the so-called “Billionaire’s Row” in Midtown. An earlier rendering released at the groundbreaking event in April. Developed in a joint venture by Madison Equities and Pizzarotti Group, the building will rises 65 floors containing approximately 150 condominiums, though generous ceiling heights and double height floors will push the building to a height more typical of an 86-story building.